Devastating hand injuries require customized reconstructive strategies to maximize functional outcomes. We report a case of thumb metacarpal reconstruction using a vascularized medial femoral condyle osteocutaneous flap in the setting of nearly complete metacarpal loss. In addition to achieving the traditional goals of reconstructing thumb length and providing stability, the medial femoral condyle flap allowed motion at the carpometacarpal joint. 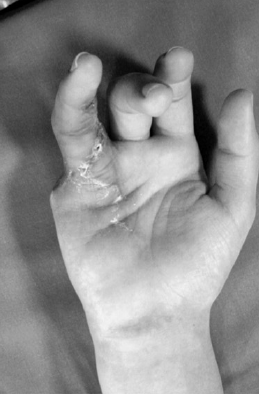 The patient’s hand function was further optimized by a component transfer of a proximally injured but distally preserved index finger to the amputated middle finger position. The patient regained satisfactory grip and thumb function with minimal donor site morbidity. This case highlights the role of both creative and established approaches to reconstruct composite tissues following devastating hand injury.